Born: 31 August 1861, Oxford, England . Died: 27 May 1923, Salisbury, England . Patrick William Forbes, British soldier, was educated at the famous school at Rugby, England. He became a captain in the 6th (Inniskilling) Dragoons and served in Zululand during 1888. 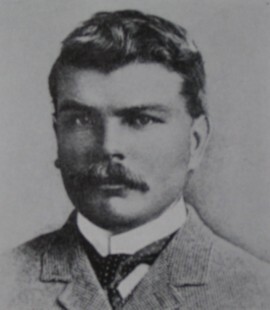 In 1890 he was second in command of the British South Africa Company's police, which entered Mashonaland (in present Zimbabwe) with the Pioneer Column. That same year he extended the company's control over Manicaland (now mainly the Mutare district, Zimbabwe) through negotiations with Chief Umtasa. He became resident magistrate at Fort Salisbury (now Harare) on 31 October 1891. He was the first officer to command the Mashonaland Volunteer Regiment and was in command of the Salisbury Column during the Matabele War of 1893. Forbes (his initials given as A.W. by Venter, 1949) made the first regular meteorological observations at Fort Salisbury (and probably the first in what is now Zimbabwe) during 1891-1892. A summary of his observations, in the form of a table containing monthly means of atmospheric pressure, air temperature, rainfall, and direction of surface winds for 1891 and 1892, was published in a book by F.C. Selous*, Travel and adventure in South-East Africa (London, 1893, p. 347). The table was later also published by A. Supan in the Meteorologische Zeitschrift (1895). In June 1895 Forbes was appointed administrator of North-Eastern Rhodesia (now part of Zambia), but was invalided home to England in June 1897. He returned in September 1898 to become staff officer of the Southern Rhodesia Volunteers, retiring to England in 1902. In January 1903 he married Beatrice Grey. Anglo-African who s who. London: Upcott, 1910.